At a very early age, Bob Pagano was always amazed by people who could make things with their own hands. His uncle and grandfather were both craftsmen and his mother came from a long line of craft ladies. "My mother, grandmother and great grandmother sewed clothing, drapes, pillows and even quilts." All the creative heritage sparked a very early desire in Bob to be creative. Starting with paper and pencil, Bob took his love for animals and worked in school to excel in arts and crafts. "I knew at a very early age I wanted to create or be creative some how." Then came Walt’s World. "Once there was a show on 'The Wonderful World of Disney' that showcased the “Imagineers” who were responsible for all of the designing, construction and production of everything. I was in awe to see how those people created that world with their own hands. That was it, I knew I wanted to do something in the arts with my life." When he started college, Bob still wasn’t sure what direction to take, so he just started taking broad art, graphics and design classes. After working in the graphics art business for a while, he knew that the “Disney” kind of world wasn't for him. Majoring in 3-d animation, film production, and screen writing, he would return to St. Louis, his birthplace, after graduation. A bit discouraged, "the only thing creative I had been working on was renovating my little house, doing landscaping, both which I enjoy very much." Then it happened, "four years ago, I was decorating my house for Christmas and wanted a very traditional and old-time looking Christmas tree; with wooden rocking horses and handmade wooden toys. 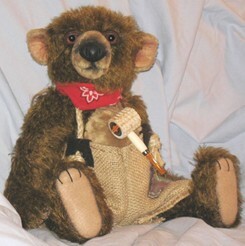 I thought to myself, what could be more traditional than a handmade Teddy Bear?" 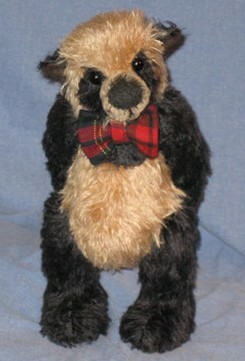 Going online, he started searching for antique, handmade bears. After finding many which sold for no lower than $1,000.00 each, he finally stumbled upon BearPile web site. "I was in awe of the craftsman-ship and the designs were so different. It is truly an art form," Bob concluded. He decided then to try and make his own handmade bear. 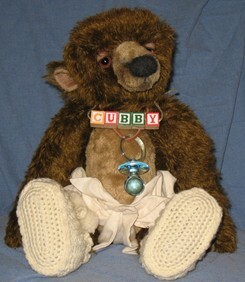 He bought his first book on making bears and it included a few patterns. "I had to teach myself how to sew. 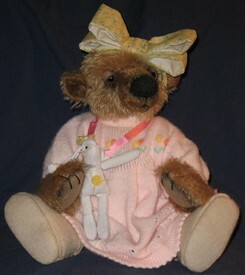 I went to the local fabric store and bought an inexpensive synthetic fabric, went home and began my first handmade bear." Recalling that time, "I think I worked on him all night long. After making the head first and seeing him staring up at me, I couldn’t leave him like that until morning." The next morning Bob woke up and there the teddy sat on his coffee table. 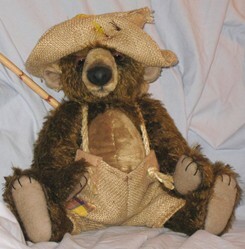 "The book said not to be discouraged if your first bear doesn’t turn out very good. But you know what, he looked like a bear that I would have purchase." "These bears have done more for me than I thought possible," Bob admitted. "They actually got my creative juices flowing again. 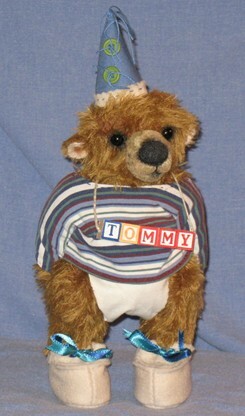 When I look at a Teddy Bear, I see through children’s eyes again." 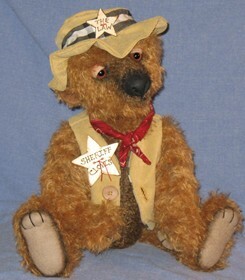 He believes that it is this remarkable ability of teddy bears which is a major attraction to most collectors. "When you look into those glass or button eyes, you are taken back to childhood even if it is just for a little while." "Teddy bears and dolls are our first friends, our loyal buddies, which is why my characters are called “Buddies,” he revealed. Bob stays busy with his own landscaping and decorative painting business when he's not working on teddy bears. "I create theme rooms for clients, or special murals and faux paint techniques. "I am trying my hand at writing. I would like to write children’s poems and short stories." 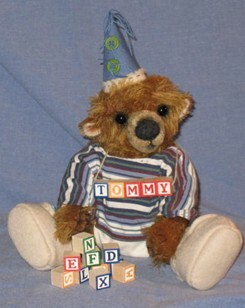 Finding inspiration from his bear characters, he jots down story ideas, filling his workshop with doodles of bears. "Most of the characters I make have clothes or accessories to help convey their character and tell a little story about each one." Drawing inspiration from the Disney's Country bears, he likes a bigger, solid nose on his buddies, so he uses Polymer clay or sculpts them from wool fabric. "I have been adding eyelids recently. I really think it adds to the character and gives them a dopey look that I like." Bob does it all; design, layout, sewing, sculpting, and web-design. Though having to adjust his schedule to fit in all his business and teddy bear activities, he does so joyfully, knowing that he'll be making teddy bears forever. "I have just started selling them a year ago and participated in my first show last year as well." 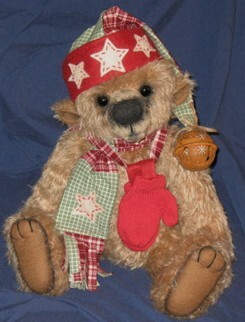 With pride he recalled, "One of my bears entered in the Collectors Choice drawing and won second prize. Talk about a boost of confidence at my first show!" Bob adds, "It’s hard to accept praise for my characters because they are such a guilty pleasure to make; like someone complimenting me for how I eat ice cream!" Continuing to evolve as a bear artist, Bob adds features that he would like to see in bears, all the while keeping in touch with a traditional style. 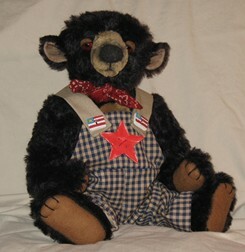 Bob sells mainly on the teddy bear auction site and from his own website. He makes his home in St. Louis, Missouri, with three noisy parrots as pets. "They are like my little room mates. Parrots have such great character and personalities," Bob remarked alluding to the future possibility of doing soft sculpted birds.